Gaining Early Awareness and Readiness for Undergraduate Programs (GEAR UP) is a competitive federally funded grant program by the U.S. Department of Education to provide six- and seven-year grants to education/community partnerships and states to increase the number of low-income students who are prepared to enter and succeed in postsecondary education. The Hennepin Technical College (HTC) GEAR UP program is a partnership grant program with the college. The program was awarded a $3.13 million dollar grant to serve seven years beginning 2012. GEAR UP serves the 2018 cohort students of Fridley and Robbinsdale school district’s middle and secondary schools. The program begins with seventh-grade students, follows through their senior year of high school, and continues through their first year of college. Increase students’ academic performance and preparation for postsecondary education. Increase students’ high school graduation and postsecondary enrollment rate. Increase students’ and their families’ knowledge of postsecondary education options, preparation, and financing. Provides one-on-one and group advising plus classroom presentations. 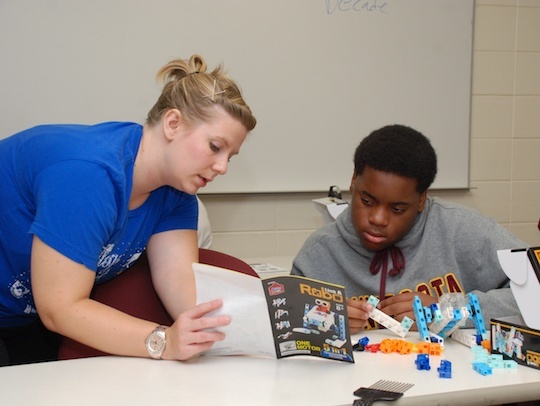 Provides tutoring support through one-on-one and small group during school day and after school. Provides career and college awareness lessons and workshops. Provides school wide assessment of college culture, readiness and preparation of students. Provides parent workshop events on topics surrounding pre-college and financial aid awareness. Provides ACT/Accuplacer preparatory services and workshops when age/grade appropriate. Offers teacher professional development opportunities. Provides academic grant funding/scholarship (when available). Beginning Fall 2018, HTC GEAR UP program will serve its first year of college students. The program will partner with colleges and universities to assist GEAR UP students with registration and enrollment process, provide advising, and connect students with academic resources, such as Tutoring Services, Mentoring program, Financial Aid Office, Student Life, Multicultural Center, etc. Students! On this webpage, you can find links from free online tutorials to financial aid information. We hope you find these resources useful. Khan Academy is a website that provides free educational tutorials in subjects from math to history. The video provides great visuals and explanations meant to supplement a student's learning. Patrick has it covered when it comes to math. He has extensive credentials and experience in math. This free website is entirely math focused and contains an array of math topics for those who are interested. Learn more about financial aid on the FAFSA website. In addition, this is the website you come to when applying for federal student aid. A checklist containing steps students must take each year to prepare for college. Narrow down your scholarship search using the FastWeb website. As ninth graders, you may not qualify for most scholarships, but knowing future qualifications will help you prepare to be the best candidate once you can apply.